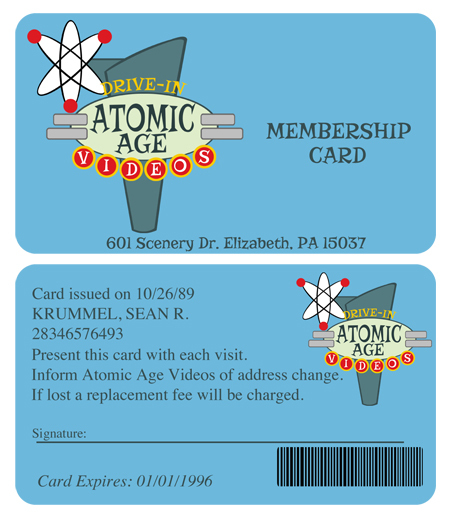 I never had my own membership card to a video store. In high school I depended on other people's cards to rent movies and then in college I mainly went for the bargain bin $10 dvds. In hindsight I feel like I missed out so I decided to make my own and get it laminated. I gave it a touch of the fifties because of my love of diners and named it to reflect my love of b-movies and drive-in's from that era of the 40's and 50's. The dates were random to add to the effect/era. I could go all out and add textures and weathering to really sell it but I won't. The address is actually the address of the video store we used to go to in Pennsylvania when I was growing up. It was a mom and pop store owned by a friend of my dad's. I think it has since become a pizza shop. Enjoy.